Buying vs. renting a home can be one of the most difficult decisions anyone makes in their lifetime. This is especially true somewhere like here in San Diego where the cost of buying and renting are very similar, at least in terms of monthly payment. 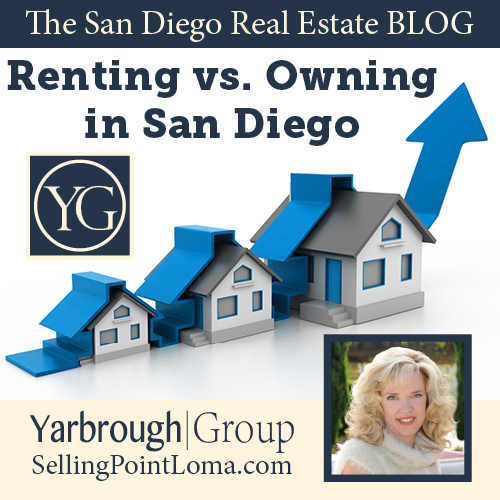 This week on the San Diego Real Estate BLOG, we help you break the numbers down. According to our friends over at the SanDiegoUnionTribune.com, it is currently cheaper to own in San Diego than it is to rent. When one considers all the factors, the benefits of owning a home win out, even if the benefit isn’t as significantly different as it is in some other parts of the country. The fact of the matter is that a combination of a fixed monthly payment, and eventual ownership of a piece of real property really helps when doing any sort of long-term financial planning. While there are ALWAYS fluctuations in ANY market, we expect this trend to continue, especially here in San Diego where there will ALWAYS be a high demand for housing. If you would like to do some very loose number crunching on your own, check out Zillow’s Rent vs. Buy Calculator for San Diego. In the end, owning beats renting here in San Diego almost every time, even if the margin isn’t quite as high as some other places in the country. There are of course a multitude of personal factors to consider, but if you plan on living here in “America’s Finest City” for more than 7 years, home ownership beats renting hands down. The return on investment and stability of home ownership just can’t be beat in most cases; especially here in the San Diego Real Estate Market where, historically, prices go up and stay up over time. If you STRONG would like to find YOUR San Diego dream home, contact The Yarbrough Group TODAY!! !